As mentioned in Part 1A of this article series, we learned how to clone your radio motors to the group transmitter. If you haven't yet assigned your radio motors to the transmitter, please see Part 1A: Cloning Motor Channels that explains how to do this. The default mode of operation is Z-Wave, and it is set to "auto-include" the Qubino trigger module into your Z-Wave network when power is first applied. There is a small OLED display built into the microcontroller board that will help with the procedure, if you remove the 4 screws that hold the cover on. The OLED display has six lines of text that will display appropriate data, depending on what you do. It is set to automatically turn off ater 5 minutes. Please Note: These instructions assume that you have pre-programmed your motors to work with the internal transmitter. We quite often pre-program the motors and transmitter for clients, but please follow this guide if you need to do this (we will be updating this article soon). There are 4 switches on the controller motherboard that are accessible without removing the cover. Two of them are on one side, and the other two are on the other side. Switch 1 and Switch 2 are used as test switches for each of the relays in the Qubino dual relay module. If you press Switch 1 (marked as S1 on the motherboard), it should issue an OPEN command to the group transmitter for the blinds (depending on how you have the radio motors programmed). 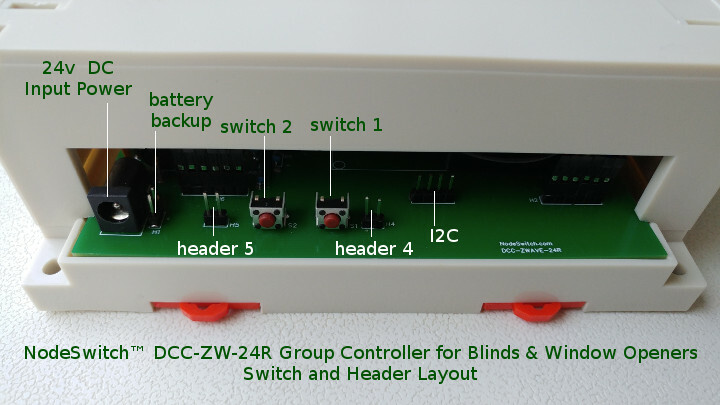 Switch 2 should perform the reverse operation, normally set to CLOSE the blinds. When you release either button, the controller will issue a STOP command to the group transmitter. We reccommend that you create an automation sequence (called a "scene" on some hubs) whereby your hub turns the relay off after a timed period that permits full excursion. You can also create different automation sequences that open the blinds or window openers partially (eg. 25%, 50%, 75% etc). Please Note: The switches are "interactive" in that they will transmit on/off status to your Z-Wave hub interface. If you hold either switch ON, you should see the corresponding virtual switch in your hub interface turn ON too. It may take a second or two for that to happen. The headers (H4 & H5) on either side of switch 1 and 2 are simply parallel connections to those switches, in case you want to hook up external switches. The I2C header exposes this useful bus so that you can connect an external device, such as an OLED or TFT display. Switch 3 (opposite side) is used with a long press to invoke the WiFi mode of operation (see Part 3 in this article series). Switch 4 is used to toggle the OLED on and off, but it really isn't necessary as the OLED will time out anyway. If the auto-inclusion process does not work with your hub, you can also install it manually. Please keep power applied to the Unity controller and make sure your hub is in "inclusion" mode. Press and hold the service button for longer than 2 seconds, as shown in the picture below (it is a plastic tab that you hold down to make contact - there is no tactile response). This process should cause the Qubino dual relay module to pair with the hub, and the 2 switches should appear in the hub app or interface. 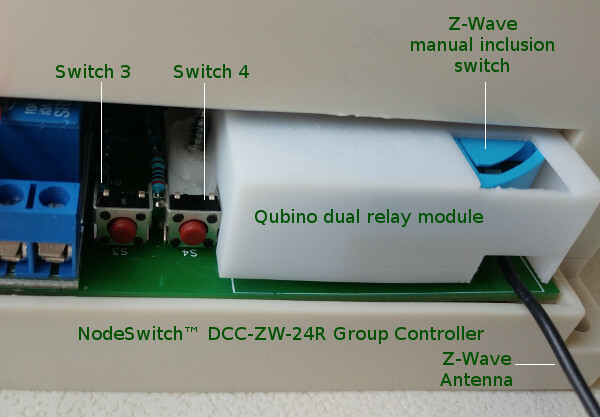 Alternatively, you can press Switch SW1 3 times within 3 seconds (see other side picture above) - this should also cause the Qubino unit to be "included" into the Z-Wave network, and the 2 switches should appear in the hub app or web interface. If you want to do a factory re-set, hold the service button down for longer than 6 seconds. (1)You may have to choose the Qubino dual relay module (Flush 2 Relay), if it is specifically supported by your hub. If not, you should choose 'generic Z-Wave device' (or something similar, depending on your hub software). The Qubino dual relay module must be operated in its default mode. There are various additional parameters that can be set for different modes of operation, but changing the mode of operation will cause it to function improperly. All you need to do is "auto-include" it when you first activate the unit. Please check this link for the Qubino dual relay module instruction manual in PDF format. It is not required reading, but we have included it in case you want to study it further.